I have a slightly ambivalent relationship with guidebooks. After all, any walker worth their salt should surely be able to devise perfectly acceptable walks from an OS map – all the information you need is there. Indeed, by choosing a route off the shelf, it could be argued that you’re missing part of the pleasure of planning a walk. But, despite my slightly begrudging feeling towards them, my collection of walking guidebooks continues to inexorably grow. So, I was wondering – do you have a favourite guidebook? I suppose that lots of fell-walkers would plump for Wainwright. 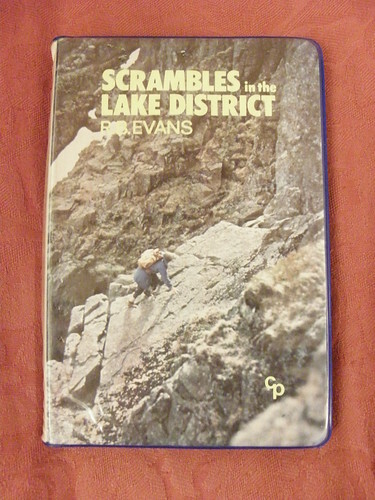 Or maybe one of the guides to the Munros – perhaps Irvine Butterfield’s book? Or the SMC guides? I suppose which is your favourite might, in part at least, be not just a function of your location but also of your age, after all these are all quite old books, and whilst the hills maybe haven’t changed much, new guidebooks seem to appear all the time. 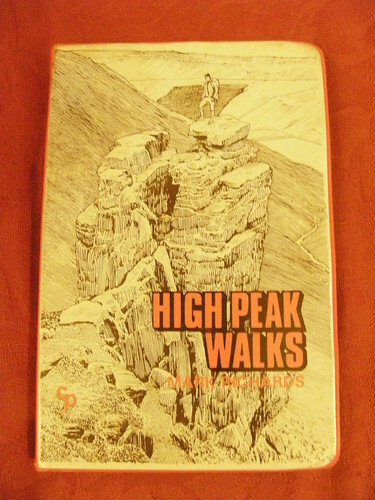 The first guidebook I bought, it is handwritten with hand-drawn maps and heavily illustrated with hatched line drawings. In other words, it’s very much in the style of Wainwright’s guides, although I’m not sure that I realised that when I bought it. My copy has slightly wavy pages having been dampened a few times when carried in a rucksack on the hill. Unlike any other guidebook I’ve bought since, with the notable exception, for obvious reasons, of the Evans’ guide to the Arnside and SIlverdale area , I think that I’ve done just about every walk in it. And Walk 6 – ‘Bleaklow Head and Higher Shelf Stones from Old Glossop’, I walked again and again, in the days when a number 53 bus from Manchester was my favoured transport to the hills. Usually, we took the alternative route across Shelf Benches and into Dowstone Clough, where I don’t remember ever meeting any other walkers. Peering into the book again now, I see that the section of path between Shelf Stones and Bleaklow Head is labelled ‘unremitting hell!’. In fact, flicking through the book, and finding another favourite walk – a short route exploring Near, Far and Middle Black Cloughs near Woodhead, I realise that it was in following pathless routes like these, up Dowstone Clough, or Far Black Clough, that I gained the confidence to ask: why not follow Wildboar Clough instead ? or Shining Clough? And then began to branch out onto routes not covered in the guidebook. Anyway, what prompted these musings when I already have several recent, and not so recent, walks to write up? Well – another question: when Grace Jones assaulted Russell Harty mid-chatshow, who was the other guest? I heard a radio programme about him, and thought that maybe readers of this blog, or the older, hill-walking readers at least, might be interested. Turns out that he was quite an odd ball. As well as being the preeminent mountain photographer of his day, he was also a parfumier for Yardley’s, and would often take to the hills heavily made-up. The Radio 4 programme about him, ‘The Perfumed Mountaineer’ is here. So – favourite guide books anyone? Having advertised the fact that my next post would be about my weekend walk in Swindale I’ve decided to delay that just a little longer to gently push you in the direction of a couple of things which might interest you. …this gentleman, who is walking around the coast of Britain and raising money for the Alzheimer’s Society. I stopped to chat with him very briefly, feeling more than a little jealous. You can follow him on Twitter (I don’t do Twitter – Andy perhaps this is your chance to investigate ‘social media’?) or find out about his walk on his website. The Wildfowl and Wetlands Trust’s competition and event which you can find out more about here. I can remember visiting Slimbridge when I was a kid. I haven’t yet been to Martin Mere which isn’t too far from here, but I’m hoping that I can fit in a trip this month, so expect more if I do manage it. A photo I inexplicably omitted after last week’s walk. I liked the way the honeysuckle winds around the tree trunk. 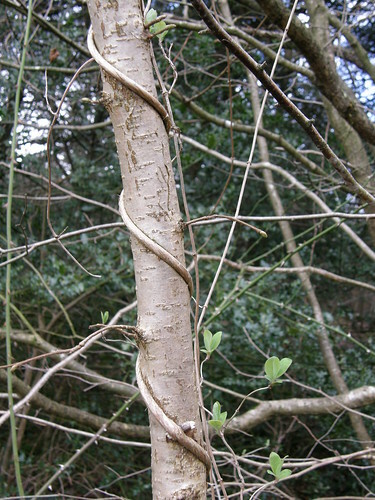 The honeysuckle leaves are another ‘outrider of spring’. This phrase is lifted from Roger Deakin’s ‘Notes From Walnut Tree Farm’ which I’ve just begun to read. Expect much more about this book in forthcoming posts. I have been out for several dawdles this weekend, all necessarily short and at toddler pace but fruitful and satisfying none the less. Can’t tell you about them yet because flickr is being awkward about rotating the photos I took in portrait orientation. As blogging has become an obsession (you may have noticed), my desire to get out and about at weekends has become even more pronounced. The need to stretch my legs, fill my lungs, blow away the cobwebs is ever present, but now I also need to explore, find new images, material – grist for the mill. Today I went to find out about a couple of things that I mentioned in posts almost exactly a year ago. Of which more later…(when flickr will play). Finally, a quote from 365 Walks, whom I discovered in the blogroll at Walk – the magazine of the Ramblers’ Association. Keep writing. Don’t let them block you. Keep walking. Don’t let life stop you. Watch for rainbows and feathers! Be idiotically persistent in your endeavors! I love the idea of being ‘idiotically persistent’, I suppose some would describe that as being pig-headed. I can live with that. I love to walk alone, but a walk in good company is hard to beat. I’ve know X-Ray for a few years now, but we normally meet in the Wagon and Horses, the George and Dragon, the Sun or another of Lancaster’s many hostelries. A perfect opportunity to natter you might think, but there’s nothing quite like a lengthy stroll to grease the gears of conversation. We covered a lot of ground on Sunday. One of the many topics we touched upon was school sport, and our attitude to competition. Now unlike X-Ray, I’m very competitive – not to the point where I let losing upset me, but I like to compete and when I compete I like to win. An element of that competitive streak informs my blogging. The quality of thought and expression on several blogs that I follow makes me wonder whether I really ought to ‘keep my mouth shut and be thought a fool, rather than open it and remove all possible doubt’. 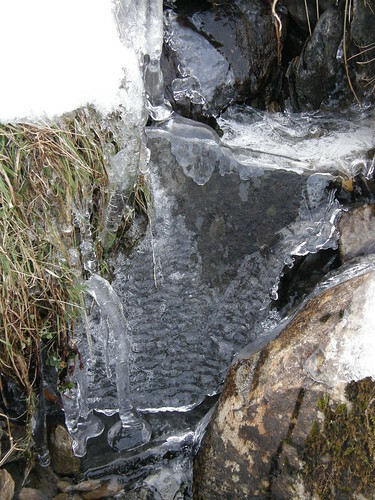 Anyway, whilst we descended into the Kentmere valley on Sunday, our bridleway crossed a tiny streamlet, thoroughly coated in ice. And (in the bottom left corner of the photo) a long icicle which by hanging into the stream had accreted new layers of ice at its base to create an ‘ice bell’. 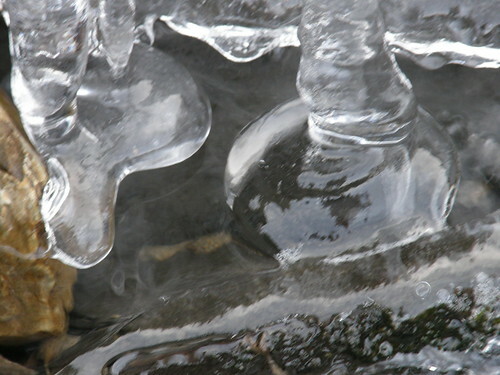 I’ve spent enough time on icy hills, I must have seen this phenomena before, but was I ever aware that I was seeing it? This time I was looking out for it, inevitably because I saw photographs of ice bells on the Internet. Incidentally, were this a competition then I’m afraid that Riverdaze would win hands down. But I’m happy – I found my very own example and have added one more motif to my totemic alphabet. Next time I intend to get a close up which is actually in focus. rule the one. link to the person who tagged you. rule the second. post the rules on your blog. rule the third. write six random things about yourself. rule the four. tag six people at the end of your post and link to them. rule the fifth. let each person know they’ve been tagged and leave a comment on their blog. I intend to ignore ‘rule the fifth’ – if any of the recipients read this post and decide to join in then so be it – but that’s up to them. Hopefully, one or two people may follow a link and discover a blog that they enjoy and might not otherwise have come across. Loren’s post certainly served that purpose for me. One: as a mathematician this incorrect and widely prevalent use of the word ‘random’ to mean arbitrary annoys me much more than it should. 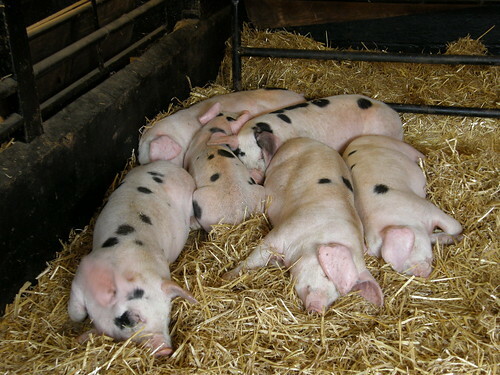 We were visiting an open farm with a huge indoor play area. I suppose I at least took a family photo, even if it was the wrong family. Three: I learned the word ‘Botanomancy’ today from Twisted Rib – one of the links from Loren’s post. I lifted a title from there that seemed appropriate for something as ephemeral and frivolous as an online game of tag. Oh OK, Six: I like Lewis Carroll. Not a short story By Edgar Alan Poe, but some thoughts about some books I have read recently, or am currently reading, and how I acquired them. …at a time when so many of us are concerned about our carbon footprint, they have no need to travel to the other side of the world to understand more about themselves and their relation to the world they inhabit. In this sense, many of the stories in this issue are studies in the local or the parochial: they are about the discovery of exoticism in the familiar, the extraordinary in the ordinary. Every so often I stumble across something which resonates, feeling like a call to arms or a manifesto for my blogging. Clearly, I wouldn’t make any grand claims to be a ‘new nature writer’, but: ‘exoticism in the familiar, the extraordinary in the ordinary’ – whether I succeed or not, that’s what I’m after. I don’t ordinarily read Granta, but at the moment I have two issues by my bedside. The other is 90 : ‘Country life: dispatches from what’s left of it’. I decided that I needed to lay hands on a copy of 102, after reading about it over at Walking and Writing and then watching an interview with Robert Macfarlane on the Granta website. I then managed to swap ‘The Book of Evidence’ by John Banville for it, through Readitswapit. I only recently discovered this site and have subsequently swapped about a dozen books, including the other issue of Granta. If, like I did, you grew up watching Saturday Morning Swap Shop then you will immediately appreciate the concept. I’ve really enjoyed it. I’ve been able to get hold of recent novels by writers that I like – ‘Beyond Black’ by Hilary Mantel for instance. But better yet, it can be a little like browsing in a second hand book shop and discovering a real gem that you have never previously encountered: I swapped have just finished reading ‘Corduroy’ by Adrian Bell, an account of farming in Suffolk between the wars which is by turns interesting, comic and lyrical. Before that I read ‘I Bought A Mountain’ by Thomas Firbank another account of farming, this time from just prior to WWII. It is very different from Corduroy, but equally enchanting. 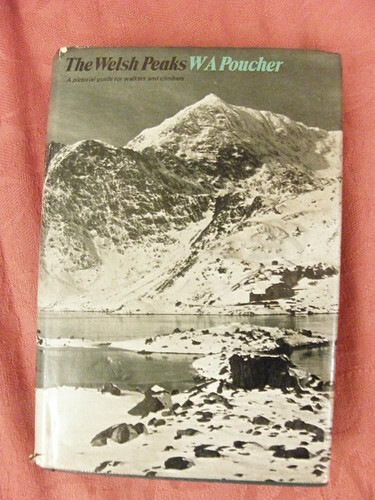 And for mountain lovers, it includes an account of a record breaking traverse of the Welsh Threes. I had heard of this book many years ago, but had forgotten, when I read about it at Walkabout in the UK (where there is an excellent article about Firbank’s life and other books – I shall have to look out for those). Shortly afterwards I found ‘I Bought A Mountain’ whilst browsing in a charity bookshop – as John says: ‘All very karmic’. Then there are recommendations on Amazon. Whilst looking at recent paperbacks that I covet (Beechcombings by Richard Mabey, Wildwood by Roger Deakin and Great British Journeys by Nicholas Crane) I checked out one of the ‘customers who bought this book also bought’ links and have now added ‘Findings’ by Kathleen Jamie to my wishlist. I’m hoping that Readitswapit will provide all four eventually. I suppose the point is that my blog reading and surfing compliments and prompts my more traditional reading. The warm air was fruitylicious and butterfly rustled. Wonderfully evocative. I’ve only read the opening chapter, but it’s so reminiscent of Russell Hoban’s ‘Riddley Walker’ that I can only imagine that the very clever Mr Self is deliberately making an homage.